Metabolism plays a role in virtually all cellular processes. Understanding how nutrients, metabolites, and byproducts flow through intracellular pathways (i.e., metabolic flux) is invaluable for elucidating disease mechanisms and designing new therapies. 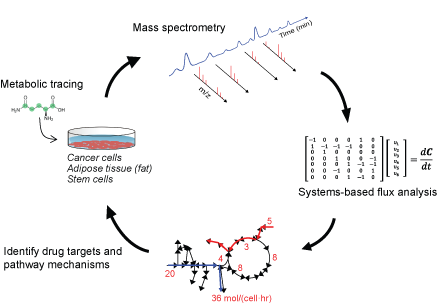 To quantitatively visualize pathway activity we employ stable isotope-labeled metabolic tracers and detect isotope enrichment in metabolites using chromatography coupled to mass spectrometry. The amount of isotope-labeled atoms that are incorporated into biomass or other pathways tells us about how our tracer was metabolized. Finally, to account for the interconnected nature of metabolic networks we apply systems-level analyses of these data, since flux through one reaction is affected by many other pathways. Oncogenes and tumor suppressor proteins induce profound changes in cell behavior to drive tumor progression. Defects in the function of metabolic enzymes or regulatory molecules can promote cancer in this manner. By correlating cancer cell genetics (mutations, deletions, etc.) with metabolic reprogramming we can better understand how metabolic pathways function in patient tumors. Ultimately we hope to use this information to design therapies that target the metabolic enzymes and pathways on which tumors rely most. Grassian AR*, Parker SJ*, Davidson SM, Divakaruni AS, Green CR, Zhang X, Slocum, KL, Pu M, Lin F, Vickers C, Joud-Caldwell C, Chung F, Yin H, Handly ED, Straub C, Growney JD, Vander Heiden MG, Murphy AN, Pagliarini R† & Metallo CM†. IDH1 mutations alter citric acid cycle metabolism and increase dependence on oxidative mitochondrial metabolism. Cancer Res (in press). Gaglio D, Metallo CM, Gameiro PA, Hiller K, Danna LS, Balestrieri C, Alberghina L, Stephanopoulos G & Chiaradonna F. Oncogenic K-Ras decouples glucose and glutamine metabolism to support cancer cell growth. Mol Syst Biol 7, 523(2011). Grassian AR, Metallo CM, Coloff JL, Stephanopoulos G & Brugge JS. Erk regulation of pyruvate dehydrogenase flux through PDK4 modulates cell proliferation. Genes Dev 25, 1716(2011). Stem cells in the body maintain tissue homeostasis through regeneration and differentiation. Pluripotent stem cells can differentiate to diverse cell types (each of the three embryonic germ layers) while serving as model systems for development, drug testing, or genetic diseases. Metabolic processes are important for stem cell maintenance, growth, and differentiation and must be controlled appropriately. Upon differentiation to specific lineages such as cardiomyocytes, cells must perform specific functions that often involve significant metabolic reprogramming. We are applying MFA to understand how metabolism operates in stem cells and changes during lineage specification. These findings may provide better means of controlling pluripotent cell proliferation and differentiation while enhancing the performance of stem cell derivatives. Vacanti NM & Metallo CM. Exploring metabolic pathways that contribute to the stem cell phenotype. Biochim Biophys Acta (2012). Metallo CM, Azarin SM, Moses LE, Ji L, de Pablo JJ & Palecek SP. Human embryonic stem cell-derived keratinocytes exhibit an epidermal transcription program and undergo epithelial morphogenesis in engineered tissue constructs. Tissue Eng Part A 16, 213(2010). Metallo CM, Ji L, de Pablo JJ & Palecek SP. Retinoic acid and bone morphogenetic protein signaling synergize to efficiently direct epithelial differentiation of human embryonic stem cells. Stem Cells 26, 372(2008). Type 2 diabetes and obesity are emerging as epidemics in the Western world. These disorders involve dysregulation of metabolic homeostasis, particularly in metabolically active cells in the liver (hepatocytes), adipose tissue (adipocytes), or muscle. These cells must constantly assess the extracellular microenvironment and respond to changes in nutrient availability by reprogramming metabolic pathways. When these responses go awry disease ensues. For example, oxygen is critical to maintain normal cell function, and limitations in tissue oxygen (hypoxia) occur in numerous pathologies. Changes in oxygen availability have profound effects on metabolism. By applying metabolic flux analysis (MFA) to cells and animals we hope to discover how changes in carbohydrate, protein, amino acid, and lipid metabolism contribute to obesity and metabolic syndrome. Heinrichsen ET, Zhang H, Robinson JE, Ngo J, Diop S, Bodmer R, Joiner WJ, Metallo CM†, Haddad GG.† Metabolic and transcriptional response to a high-fat diet in Drosophilia melanogaster. Mol Metab 3, 1(2014). Metallo CM, Gameiro PA, Bell EL, Mattaini KR, Yang J, Hiller K, Jewell CM, Johnson ZR, Irvine DJ, Guarente L, Kelleher JK, Vander Heiden MG, Iliopoulos O & Stephanopoulos G. Reductive glutamine metabolism by IDH1 mediates lipogenesis under hypoxia. Nature 481, 380(2012). We are developing new methods to probe metabolic pathways in greater detail. These include tools to study pathways involved in redox control and within individual cellular compartments. 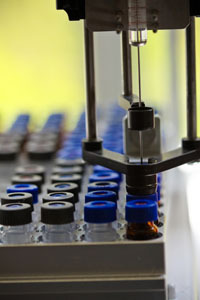 Additional approaches involve the application of discovery-based methods to probe metabolism in a non-targeted manner. As these techniques are validated and applied to in vitro and in vivo systems they will improve our ability to study the diverse metabolic pathways involved in cancer progression and metabolic disease. Walther JL, Metallo CM, Zhang J & Stephanopoulos G. Optimization of 13C isotopic tracers for metabolic flux analysis in mammalian cells. Metab Eng 14, 162(2012).